General Secretary of the Communist Party of Việt Nam(CPV) Central Committee Nguyễn Phú Trọng and Prime Minister of Hungary Viktor Orban agreed to lift bilateral ties to the level of comprehensive partnership, per a joint statement issued on Monday in Budapest. The CPV chief said Việt Nam considers Hungary a leading partner in central Eastern Europe and congratulated the country on its socio-economic achievements, catapulting the country to become one of the leading economies in the European Union with political stability and social unity. Orban, for his part, said Hungary considers Việt Nam its most important partner in Southeast Asia, affirming the visit will create a new milestone and driving force for bilateral ties. 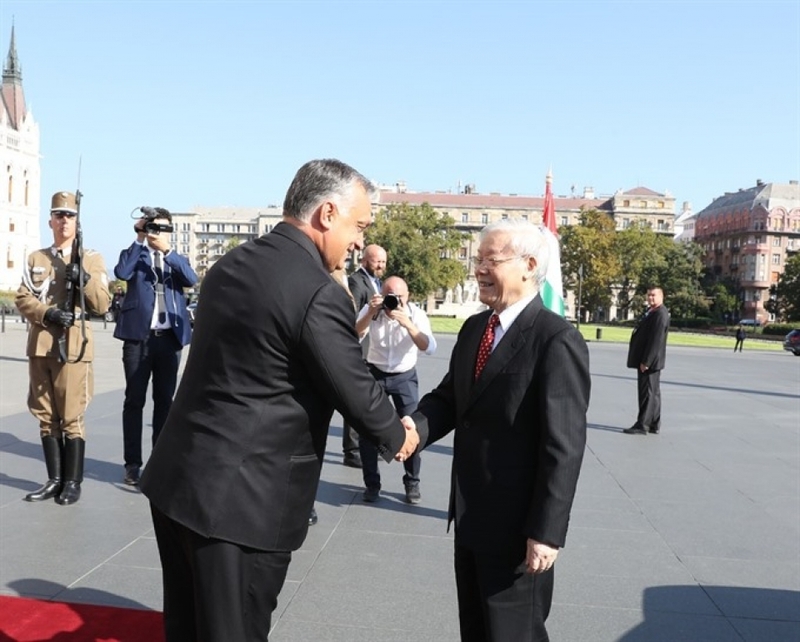 Prime Minister of Hungary Viktor Orban (left) welcomes General Secretary of the Communist Party of Việt Nam(CPV) Central Committee Nguyễn Phú Trọng on Monday. Both sides agreed to maintain regular visits and exchanges between high-ranking leaders, strengthen political consultations and strategic dialogues via Party, Government, and National Assembly channels, as well as between ministries, agencies and localities. They expressed their determination to foster collaboration in diverse areas, especially in economy, trade, investment, national defence, education-training, science-technology, environment, healthcare, culture, sports and tourism, as well as share experiences in maintaining traditional cultural identities during development. Host and guest pledged to strengthen consultations on regional and global issues of shared concern and co-operation at multilateral organisations and forums, particularly at the United Nations, the Asia-Europe Meeting and the Mekong-Danube Co-operation Initiative. The General Secretary affirmed that Việt Nam supports Hungary in extending co-ordination with ASEAN members and stands ready to help the country expand economic ties with the bloc. Expressing his commitment to promoting the Việt Nam-EU partnership, the Hungarian PM vowed to push forward the early signing, ratification and implementation of the EU-Viet Nam Free Trade Agreement, contributing to reinforcing EU market connectivity, including that between Hungary, Việt Nam and ASEAN. As there remains room to boost their bilateral partnership, the two sides agreed to increase activities of the Việt Nam-Hungary Inter-Committee on Economic Co-operation; create favourable conditions for the two countries’ business communities to meet and seek new opportunities; as well as expand co-operation in healthcare, water management, information technology, pharmaceuticals, food safety, environment protection and renewable energy. The Vietnamese leader hailed Hungary for considering Việt Nam a priority partner in its official development assistance policy. He suggested working together in fields that suit Hungary’s capacity and meet Việt Nam’s demand. He thanked the Hungarian government for continuing to supply 200 scholarships to Vietnamese students each year. The two sides promised to expand ties across culture, sports and tourism to raise mutual understanding and friendship between the two peoples, as well as to step up plans marking the 70th anniversary of diplomatic ties in 2020. The two leaders witnessed the signing of seven co-operation documents between the two countries. The documents included an inter-government agreement on judicial assistance in civil matters, a memorandum of understanding (MoU) on defence co-operation between the defence ministries of the two countries, another MoU on collaboration between the Vietnamese Ministry of Health and the Hungarian Ministry of Innovation and Technology and a plan on education co-operation in the 2019-21 period between the Vietnamese Ministry of Education and Training and the Hungarian Ministry of Human Resources. The Hungarian Water Association also signed MoUs with the People’s Committee of Quảng Nam Province on the Quảng Bình II clean water supply project, with the People’s Committee of Vĩnh Long Province on a water treatment project in the province and with the People’s Committee of Thanh Hóa Province on a clean water supply project. Later on Monday Trọng met Deputy Speaker of the National Assembly of Hungary Hende Csaba in Budapest. The two sides agreed to create favourable conditions for the two legislatures to exchange high-level delegations, as well as enhance exchanges between parliamentary agencies and friendship parliamentarians’ groups to share experience in law-making, supervision, personnel training. They vowed to step up collaboration between the two countries’ localities and offer all possible support to their friendship parliamentarians’ groups to effectively tap their role in developing ties between the two legislatures. Stressing the importance of economic, trade and investment cooperation in boosting bilateral relations, host and guest agreed to step up the co-operation to match with fine political and cultural ties. Csaba affirmed that the Hungarian National Assembly backs Việt Nam’s comprehensive co-operation with the European Union. He vowed to boost the NA’s soon ratification of the EU-Việt Nam Free Trade Agreement after it is signed so as to create a driving force for economic collaboration between Việt Nam and Hungary and other EU countries. At the meeting with Hungarian Socialist Party (HSP) Chairman Tóth Bertalan on Sunday, Vietnamese Party chief Trọng expressed his hope that the HSP will continue to support Việt Nam. The Party chief called on the HSP to help the 5,000-strong Vietnamese community in Hungary to integrate into the host society, while contributing to co-operation between the two countries. The leader affirmed that his visit aims to consolidate and advance the bilateral traditional friendship. He highlighted Hungary’s support for the just cause of Vietnamese people during the past struggle for independence, as well as the present national development. Việt Nam always keeps in mind the valuable assistance of the Hungarian state and people, he said, adding that various Vietnamese generations have studied in Hungary and many of them have held important positions in Việt Nam after returning home. 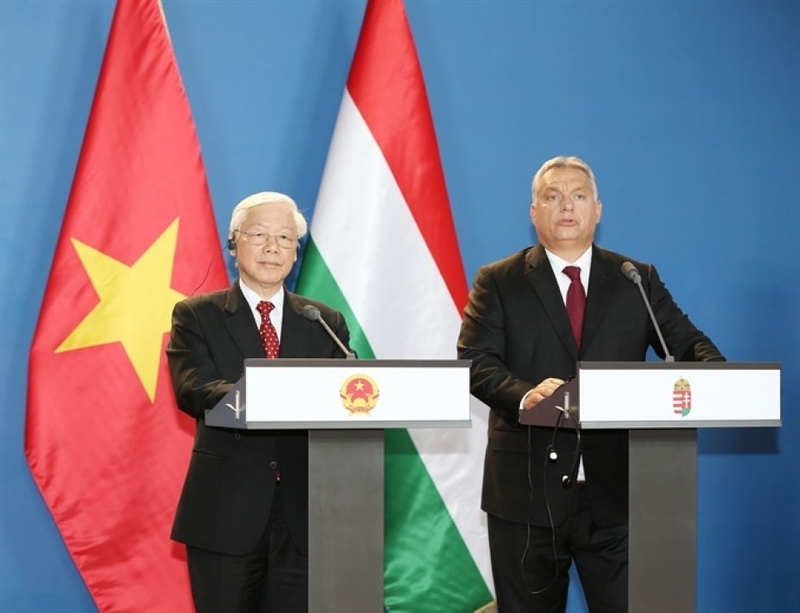 General Secretary of the Communist Party of Việt Nam (CPV) Central Committee Nguyễn Phú Trọng (left) and Prime Minister of Hungary Viktor Orban at a press brief on Monday. For his part, Bertalan described Party General Secretary Trọng’s visit as an important event in the history of the bilateral relationship. The HSP always supports policies that aim to consolidate and enhance the friendship with Việt Nam, he said. Hungary is always a close friend of Việt Nam, he added, affirming the faithful friendship as an immutable value. Hungary is a door for Việt Nam to expand its relations with the EU while Việt Nam serves as a gateway for Hungary to step up its ties with Southeast Asia and Asia at large, the host said, expressing his hope that the Vietnamese Party chief’s visit will open up doors for both sides. The same day, the leader met with staff of the Vietnamese Embassy and representatives of Vietnamese expatriates in Hungary. The leader emphasised that the Party and State consider overseas Vietnamese an integral part of Việt Nam. He asked the expatriates to remember their origin, assist each other, uphold national cultural identities and contribute to the two countries’ connections. “Each person is a nucleus, a seed and a bridge in the friendship and co-operation between the two countries,” he noted. He also asked the embassy to work harder to reinforce bilateral ties and support the Vietnamese community in Hungary.